This year, Tia has become infatuated with the "next big thing" and once again, it is something that has been around for about as long as she has been alive. In fact, this one has been around for LONGER than she has been alive...Pokemon. 1st, it was Harry Potter. Please...my son who is now 21 years old (eep!) watched Harry Potter when he was younger than Tia is now. 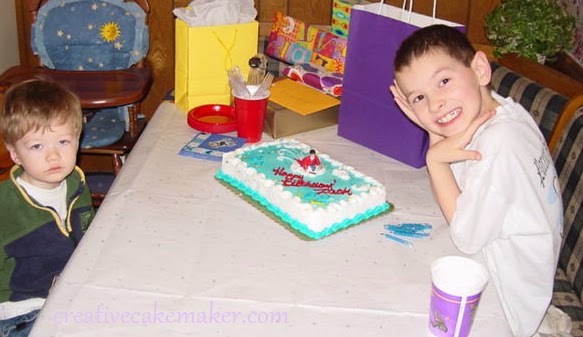 In fact, his 9th birthday cake was Harry Potter playing quiddich. From 2002. I just "love" how thrilled Tristan looks here. Then it was Littlest Pet Shop ("but not the NEW kind...I want the OLD kind"). Now, it's Pokemon. That same 21 year old son played with Pokemon when his now-14-year-old brother was but a wee babe wanting to chew the trading cards. 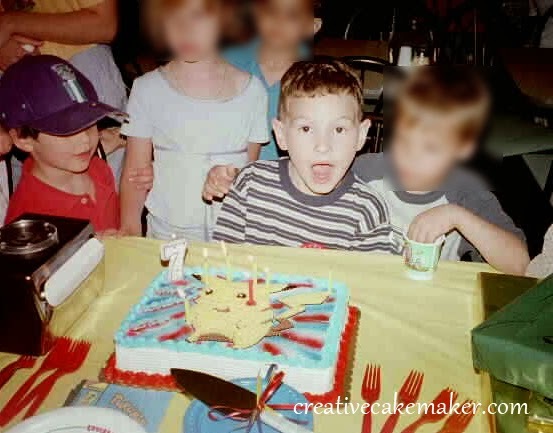 In fact, his 7th birthday was a Pokemon cake. This was in 2000. Back then, I was better at putting together parties...not cakes. The cake came from the Harris Teeter grocery store bakery. Pikachu is all icing. They did a GREAT job with this cake. Sure wish we'd kept all his old Pokemon stuff. It would have been easier than trying to find it all now. So anyway...I got a request from Tia for a Pokemon cake. But that's not all...she wanted it to be a Tres Leches cake. Me: Sigh (again)...okay, let's figure it out. The problem is, Tres Leches cake can't be carved. The topping is very very light whipped topping. Regular icing wouldn't go well with Tres Leches cake. Up until this announcement for a Tres Leches cake, she had been wanting a 3-D Pokeball cake. I had it all figured out. I was planning to use my Betty Crocker Bake and Fill dome pan to make the Pokeball. Now, that was not going to happen. How on EARTH was I going to decorate it with a Pokemon??? Then it dawned on me...colored coconut! Perfect! To color the coconut, I put some plain sweetened shredded coconut in a Ziploc sandwich bag along with a dab of liquid food coloring, sealed the bag and shook it like crazy. The food coloring coated all the coconut with the color. 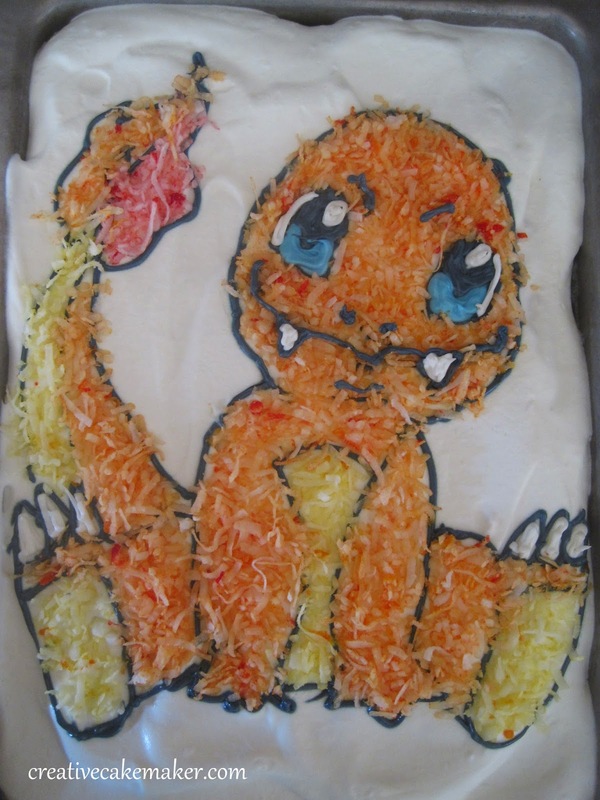 Her favorite starter Pokemon is Charmander so I found this ultra-cute image of him from Ominousonibi on deviantART that I used as a template for the cake image. I apologize for the complete lack of photos of the decorating process for this cake. I was in quite a bit of a hurry and really winged it for most of the decorating. Simply put, outline in icing, fill in with coconut, fill in eyes, teeth, mouth, chin, nose, claws and eyebrows with icing. Done! By the way, I used this recipe for Coconut Tres Leches Cake from Mel's Kitchen Cafe. It's REALLY good. Not too sweet.